Ever wanted to use Elance to hire virtual staff? This is the second part in the series. 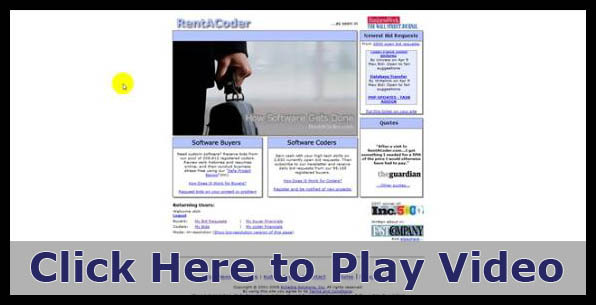 In the first part I gave you a virtual of Rent-a-coder.com, now known as Vworker. Here’s an over-my shoulder tour of the site. I teach you how to use it, what to look for when hiring staff and posting projects and share some of my most closely guarded tips and tricks on how to get the very best from the site. Stay tuned for future video casts where I give you personal tours of my other favourite sites! Enjoy, and if you found it useful, please use the retweet button to share it! Ever wanted to use Rent-A-Coder to hire virtual staff? Here’s an over-my shoulder tour of the site. I teach you how to use it, what to look for and share some of my most closely guarded tips and tricks on how to get the very best from the site. Stay tuned for future video casts where I give you personal tours of my other favourite sites, elance and guru.com!